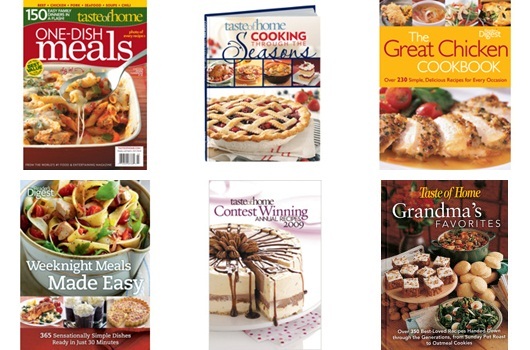 HUGE Taste of Home $5 book sale + 7% cash back $ free shipping* w/ code! I love Taste of Home! I’m a subscriber to the magazine and a buyer of their cook books and my cousin and I cannot wait to go to Cooking School each year! 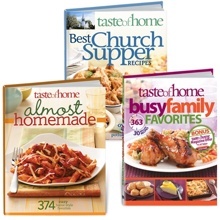 That’s why I’m so excited that Taste of Home is having a GIANT $5.00 book sale right now! WooT! There are a ton of books on sale – Christmas, Thanksgiving, fall, casseroles, comfort foods and even some adorable children’s books! I also found this great deal for a set of 3 books – Family Meals and Church Suppers is 87% off right now! Get it for $9.99 + your 7% cash back! Log into your ShopAtHome.com account (or sign up first, it’s free and you’ll get a $5 bonus after your first purchase!). 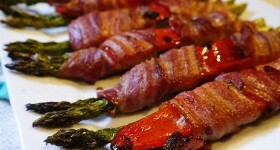 Then check out the Taste of Home Coupons page and click “Shop Now”. Click the Sale link and find some great books to add to your basket. Then add Coupon Code: LST88 which will add free shipping to orders over $20.00. Check out my How to earn cash back with ShopAtHome.com tutorial. Thanks to Super Coupon Lady! Previous Post: Have a Spooktacular Halloween!